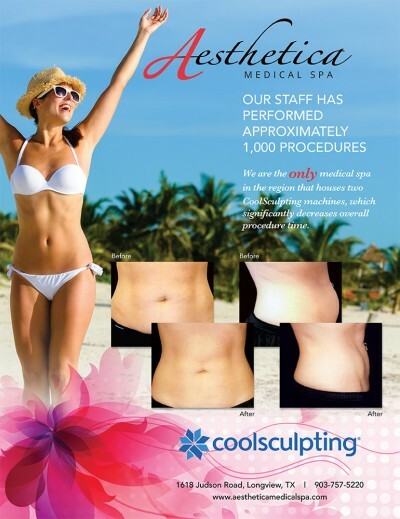 The CoolSculpting procedure reduces stubborn fat safely and effectively, without surgery or downtime. This fat reduction treatment is the only FDA-cleared procedure to use controlled cooling to safely target and reduce diet- and exercise-resistant fat. CoolSculpting results are proven, noticeable, and lasting, so you'll look and feel great from every angle. DISCLAIMER: results will vary from person to person. Aesthetica owns two CoolSculpting machines that can cut in half the time it takes to complete some procedures. You will like what you see. In the weeks and months following your procedure, your body naturally processes the fat and absorbs these dead cells. Once the treated fat cells are gone, they're gone for good. ANSWER: Good candidates have noticeable bulges in certain areas they’d like to get rid of. The CoolSculpting fat reduction procedure is specifically designed for those who have unwanted fat that resists diet and exercise. Unlike gastric bypass surgery, the CoolSculpting procedure is not a weight loss solution for people who are obese. It is, however a non-surgical alternative to liposuction. Request a one-on-one consultation with us to determine if the CoolSculpting procedure is right for you. Please note that results will vary from person to person. QUESTION: Where does the fat go? ANSWER: Once the treated fat cells are crystallized (frozen), your body processes the fat and absorbs these dead cells. (Research is on-going regarding whether new fat cells are generated after puberty.) Coolsculpting scientific studies are available for further review. ANSWER: The CoolSculpting procedure is FDA-cleared for the flank (love handles), abdomen, back (bra strap area), chin, thighs and underneath the buttocks. With over one million CoolSculpting treatments performed worldwide, it is proven to be a safe and effective treatment for non-surgical fat reduction.